Dog lovers know the importance of buying dog accessories for their dogs. Dog accessories make your dog stand out and gives your dog a fun look. The list of pet accessories for dogs is endless because people always make new pet accessories in different designs for dogs. However, there are pet accessories for dogs that have been available for a very long time. Dog collars give your dog a unique look and can be used to identify your dog. When picking a dog collar, make sure you take the size of your dog and the weight of the dog and collar into consideration. You can choose collars in different colors and designs, but make sure they are side-release collars because they are the strongest and easiest to use. Look for breakaway collars for cats because they are the safest ones to use. Leashes help you control the movement of your dog anytime you both are out for a walk. Make sure you get a strong leash that does not come off easily. And make sure it is long enough to allow the dog to move freely as you walk together. 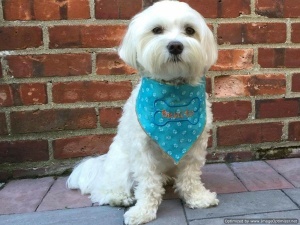 Dog bandanas can make your dog really stand out among other pets anywhere you go. They come in different bright colors and beautiful designs that you can even wear the one that complements your outfit on your dog. 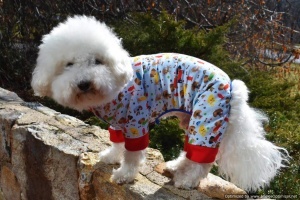 Yes, dogs can also wear pajamas. Get your dog nice pajamas that fit comfortably for a really unique look. Dogs also wear dresses. 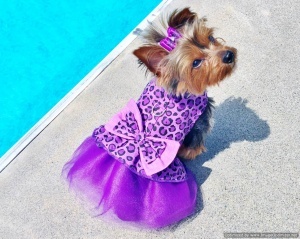 If you go online, you will see dogs in beautiful dresses. If there is a party coming up, you can get your dog ready for that party by buying it a beautiful dog dress. Dog tags help your dog introduce itself to anyone it is meeting for the first time. Dog tags are in different nice designs that can show off your pet’s personality. Backpacks for dogs are great accessories that will allow your dog to carry its own stuff. They make your dog look unique, but you must make sure the content of your dog’s backpack is not too heavy for your dog. Most dogs can swim very well; however to make sure they are absolutely safe when inside water or around water, make sure they are wearing a floatation device. A type of floatation device is dog life vests. Life vest for dogs has handles that you can use to pull your dog out of the water if the need to do so arises.